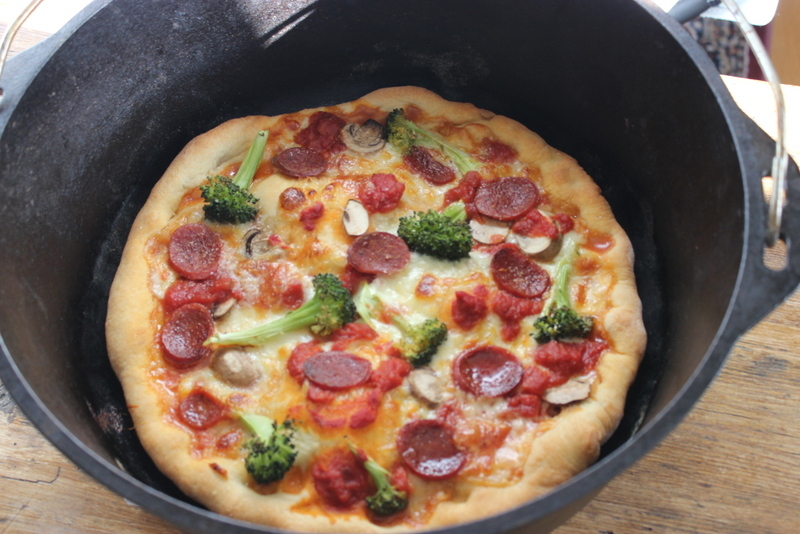 Tony writes: I’ve become slightly obsessed with cooking pizza in cast-iron. Why cast-iron? It retains heat well (think Chili’s fajitas), so the dough gets a crisp crust and a nice, puffy texture. Over the last while, I’ve been tinkering with the method for both a regular pie and deep-dish and each is relatively easy, This cast-iron technique entails two more steps than your basic pizza method: pre-heating the pan and blind-baking the crust (see below). 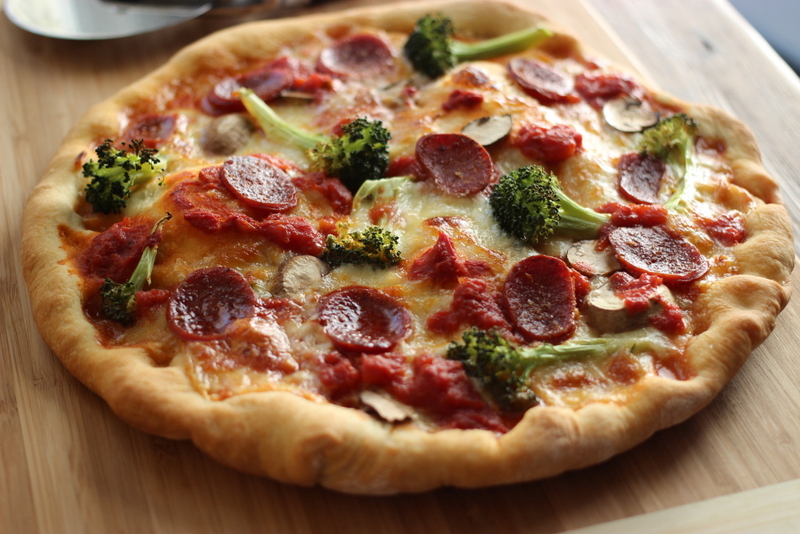 After that, just top the pizza amply and bake until the cheese bubbles and browns: home pizza that looks and feels like a pizzerias’. – “Blind-bake”: Blind-baking, or pre-cooking a crust without its toppings, is standard procedure with pies (pie pies like blueberry pie or apple pie). I like to follow this technique with cast-iron pizza. I don’t full-on cook the dough through, just lightly brown it (about 8 minutes) to ensure the bottom crust doesn’t have a soft, doughy texture once the toppings get added. After this initial browning, I add the toppings to the browned shell and finish baking. 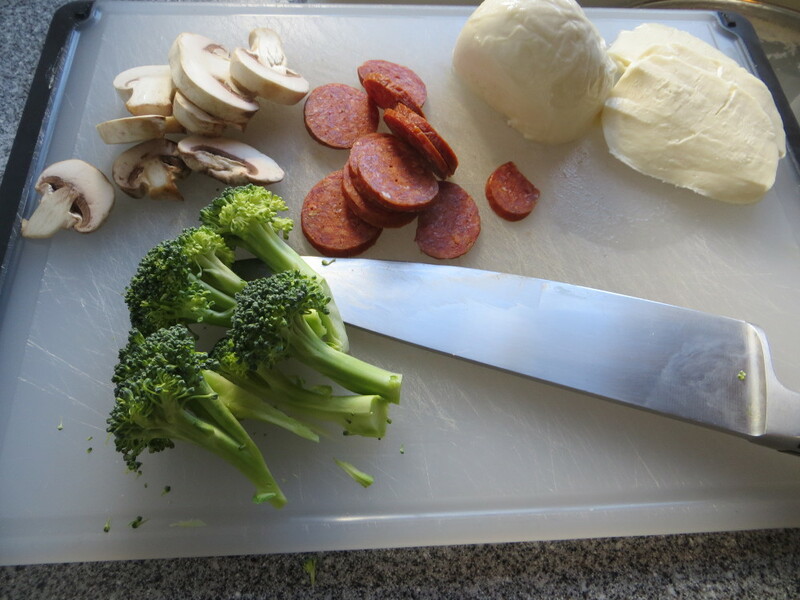 Photo Note: The recipe below is for my favorite deep-dish pizza pairing (sausage and cherry peppers), but the pictures are for my favorite photogenic pairing (broccoli, pepperoni, and mushrooms). Use the base recipe and then you do you with the toppings. 1. Make the dough: Measure out 3/4 cup lukewarm water (technically, it should be 100F to 110F; if the water is warm-ish, you’re good) and mix in 1/2 tsp. granulated sugar and 1 tsp. active dry yeast (about half a packet). Let sit for 10 min to check that the yeast is alive and well (the top of the liquid will foam and thicken). 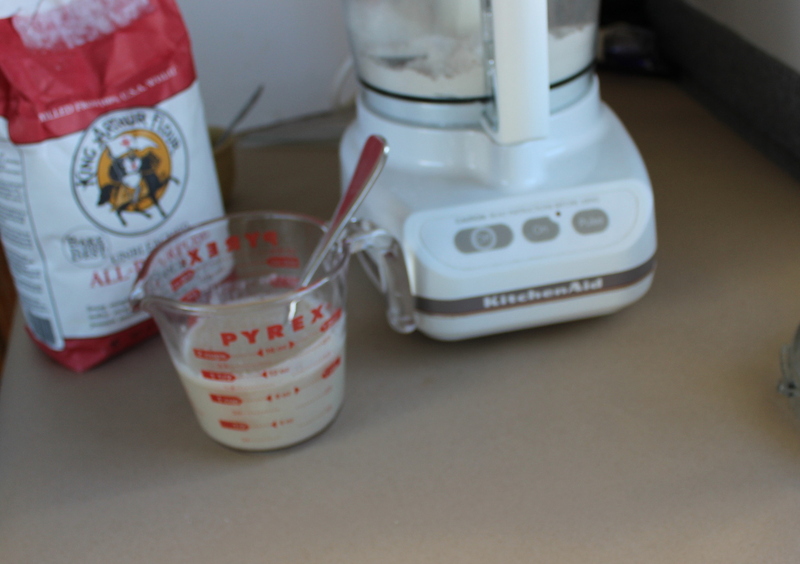 Add 2 cups all-purpose flour (10 oz.) and 3/4 tsp. kosher salt to a food processor (or standmixer) and pulse (or whisk gently) to mix. Still pulsing (or whisking), pour in 2 Tbs. olive oil and the yeast mixture. 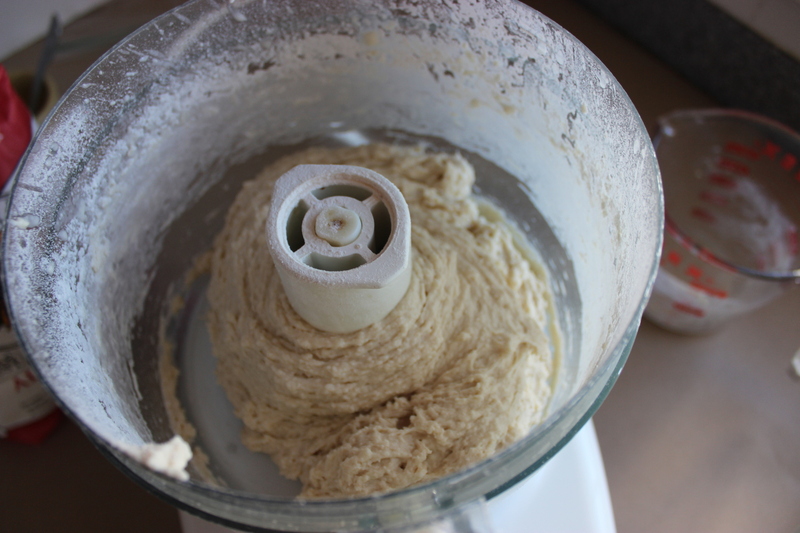 Pulse (or whisk) until the mixture comes together into a uniform dough. Adjust with a splash of water or flour if the mixture is wet or crumbly and dry). On a lightly floured work surface, knead the dough for 2 or 3 min so it becomes uniform and elsasticky; it should spring back when pressed. Transfer to a large, lightly oiled bowl, top with a dish towel, and hold somewhere warm until it doubles in size, about 1 hour; or hold in the refrigerator for up to 1 day. 2. Organize the toppings: This is really up to you; far be it from me to tell you how to top your own pizza. I like 1/2 lb. roasted Italian sausage (cut in 1/2-inch pieces) 3/4 lb blend of cheeses (Parmigiano, mozzarella, and fontina), 2 cups tomato sauce (2 cups whole, peeled tomatoes, pureed in a food processor and seasoned with salt, pepper, and fresh basil, and 2 jarred hot cherry peppers. 3. Roll out and blind bake the dough: Heat the oven to 425F; give the oven at least 30 min to properly preheat. Set a 12-inch cast-iron skillet in the oven for 10 min to heat. 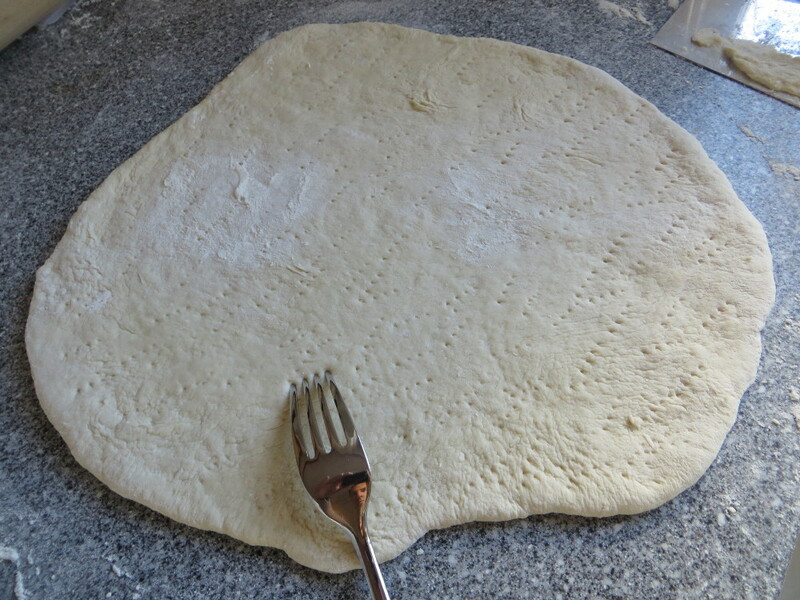 Meanwhile, on a lightly floured work surface, roll the dough out into an 18-inch round. Brush the top side with 2 Tbs. olive oil. Using an oven mitt, remove the skillet from the oven and set on a trivet or dish towel. Using both hands (without the mitt now), transfer the dough (oiled sound down) into the skillet; use a small heatproof spatula (or carefully with your fingers) press the dough to fit the contours of the pan; against and up the sides. Use the tines of a fork to lightly mark the dough (this will prevent it from puffing), brush with some more olive oil (especially the edges) and transfer to the oven. Bake until the dough browns lightly, 8 to 10 min. 4. 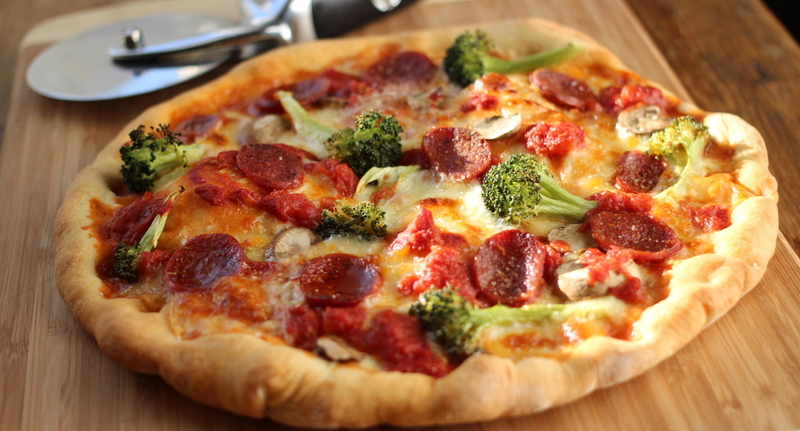 Top and bake: Sprinkle half of the cheese on the dough, top with half of the meat or vegetables, and half the sauce. Repeat, reserving the remaining sauce for after baking. Bake until the cheese bubbles and browns and the pie cooks through, about 20 min. Top with the remaining sauce and let cool for a couple of minutes; then cut into wedges and serve. Amanda writes: I’ve become so burrito-obsessed lately that I’ve decided to start making them for the family (easier, cheaper, more fun – right??). Got any recipe ideas? Tony’s take: I’m burrito obsessed, too, Amanda. Like, a lot. I frequent Chipotle and other local burrito spots often and I also make them myself every now and then. The preparation is a good fit for a busy week. You won’t necessarily save loads of money, but you can cook up big batches of varied, vibrant fillings and then graze on them for the next day or two (rice and beans reheat fine). Look, burritos are not fine dining, but beans, vegetables, and lean protein offer balance and nutrition and they’re good eating. I’ll take them over meatloaf every weeknight of the week. Since burritos are all about the fillings, here are 4 mini recipes for the essentials as well as a basic gameplan to roll. Spicy Pinto Beans with Chipotle and Bacon: Purists favor dried beans (and so do I; they’re great), but canned beans are perfectly fine here and far more manageable. Bacon offers a little richness while a handful of spices impart depth. Yields 3 cups. Recipe: Cook 2 slices bacon (about 2 oz., cut into thin strips) with 1 Tbs. olive oil in a heavy-based pot over medium heat, stirring, until the bacon renders its fat and starts to brown, about 5 minutes; transfer to a plate lined with paper towel. Spoon off all but 1 Tbs. of the bacon grease. Still over medium heat, add 2 smashed garlic cloves and cook until the garlic starts to brown lightly, about 1 min. Add 2 tsp. ground cumin, 1 tsp. chile power, 1 tsp. chopped fresh thyme (or 1 tsp. dried oregano), and 1/4 tsp. chipotle powder. Cook, stirring, until the spices become fragrant, about 30 seconds. Add 2 15-oz cans pinto beans (rinse and drain the beans first), 1 canned chipotle chile (finely choppy), 2 Tbs. tomato paste and 1/2 cup water. Bring to a boil, then reduce to a gentle simmer, cover, and cook, stirring occasionally, until the flavors mix and meld, 15 to 20 minutes. Add a splash of water if the mixture dries out. Season with salt and lime juice to taste and serve sprinkled with the bacon; or let cool and refrigerate for up to 4 days. Grill-Marinated Chicken: If you have the time, marinate the chicken up to a couple of days ahead (with the oil, garlic, and spices) so the flavors soak in. Boneless chicken thighs have a little fat which keeps them juicy on the grill. If you want to make this with beef, try flank or skirt steak, chewy cuts with big flavor. Serves 4 to 6. Recipe: In a food processor, pulse 1 garlic clove (coarsely chopped) with 1/4 cup olive oil until it’s minced to a paste (you may need to scrape down the sides of the work bowl). Add 2 tsp. ground cumin, 1 1/2 tsp. kosher salt, 1 tsp. chile powder, 1 tsp. granualted sugar and 1/4 tsp. chipotle powder and pulse. Spread this spice paste over 1 1/2 lb. boneless skinless chicken thighs (or breasts). Transfer to a large zip-top bag and refrigerate for at least 4 hours and up to 2 days. 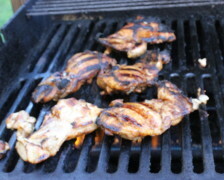 To cook: grill (or broil) the chicken over medium-high heat until cooked through, about 4 minutes per side. Let cool for 5 minutes, then chop and serve. Spicy Summer Corn Salsa: Canned corn has its merits, but not in a salsa. Not now, when summer corn is sweet and in season. 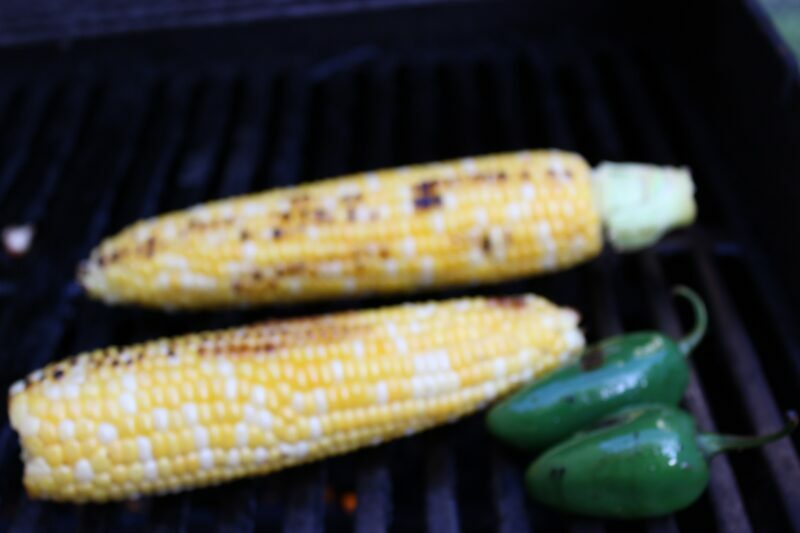 Grill up fresh cobs or use leftover grilled or boiled ears. Yields 3 cups salsa. Recipe: Drizzle 2 ears corn with 1 Tbs. olive oil and sprinkle with S+P. Grill over a medium fire, flipping every minute or two, until the corn browns lightly, about 8 min total. Transfer to a cutting board to cool, then remove the kernels from the cob (use a paring knife). In a medium bowl, toss the corn kernels (about 1 1/2 cups) with 2 plum tomatoes (cut in 1/2-inch dice), 1/2 cup chopped fresh cilantro, 1/2 red onion (finely diced), the juice of 1 lime (about 2 Tbs. ), 1 jalapeno (seeded and finely diced) and salt to taste (about 1 1/2 tsp.). 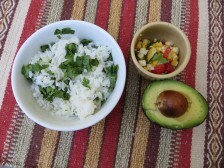 Cilantro-Lime Rice: This recipe is little more than steamed rice with flavorings: use Jasmine rice, steam it with a touch of oil so the grains don’t stick, and then toss with the lime and cilantro. Yields 4 cups rice. Recipe: Bring 3 1/2 cups water to a boil in a medium saucepan. Stir in 1 1/2 tsp. kosher salt and 1 Tbs. olive oil and then 2 cups Jasmine rice. Reduce to a simmer and cook, stirring once or twice, until the rice absorbs most all of the liquid. Reduce the heat to medium-low, cover, and cook for 20 minutes without disturbing so the rice steams and finishes cooking. Transfer to a large bowl and fluff/toss with the juice of 1 lime (about 2 Tbs.) and 1/2 cup chopped fresh cilantro. Season with more lime juice and salt to taste. 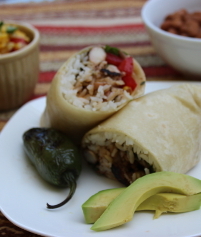 Gameplan: Big burritos demand big tortillas. Restaurants generally use 12+ inch tortillas. In the supermarket, it’s hard to find anything much bigger than 10 inches (these will be labeled “burrito-size”). Measure out your fillings accordingly – nothing worse than a busted burrito. Add in guacamole, grated cheddar, or sour cream if you like. To assemble: spread some rice in the center of a warmed tortilla (heat in a skillet or the microwave), top with the beans, chopped chicken, some corn salsa, and a couple shakes of hot sauce (try El Yucateco for big-boy heat). Then roll: fold the side closest to you over the filling (over and away from you), fold the sides in to the center and roll away (check this video from Porkyland for decent folding technique). Serve and enjoy.